Everyone likes to think the best playground is in their neighbourhood. Well, kids like to think that anyway! Last year, one particular playground was judged as Australia’s best. Do you know where it is? 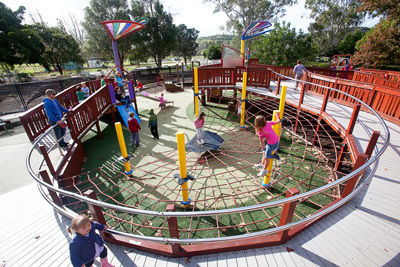 Parks and Leisure Australia have named Speers Point Park at the northern end of Lake Macquarie in New South Wales as the ‘Best Play Space in Australia’. In addition, the park scooped the Design Award for Excellence at the 2011 Australian Institute of Landscape Architects (AILA) awards. 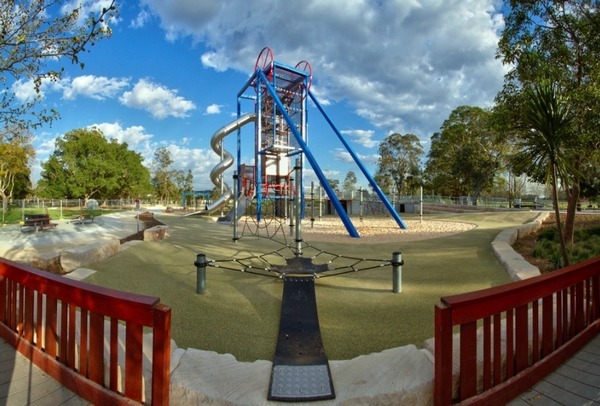 Speers Point Park spans a massive two hectares and includes a double flying fox, giant slide, water play area, maze, a sensory garden and a bike path complete with road signs, small bridges and corrugated and marked surfaces. The all-ages and all-abilities playground was judged on its design, response to community needs and play value. The centrepiece of the park is the huge tower, designed to reflect the influence of mining in the Lake Macquarie district.. The tower has climbing nets and stairs to the top and a spectacular nine metre spiral slide. I like the inclusion of an Archimedean Screw in the water play area (shown below). It’s an ancient spiral device which, as it’s turned, draws water up into a small weir (which can then be let out via a plug). Knowing how much kids love fetching, carrying and trying to contain water, the inclusion of this simple piece of equipment will prove very popular. The park was built in stages and officially opened last October with the completion of play areas including a Quiet Zone retreat, specifically designed for children with autism spectrum disabilities, and tactile orientation totem poles for people with visual impairments more recently. Thanks to Babyology reader Angela for alerting us to Speers Point playground. If you have a great playground near you, let us know (and don’t forget to add it to the Playground Finder! ).